Children of the Can Released Today!!! 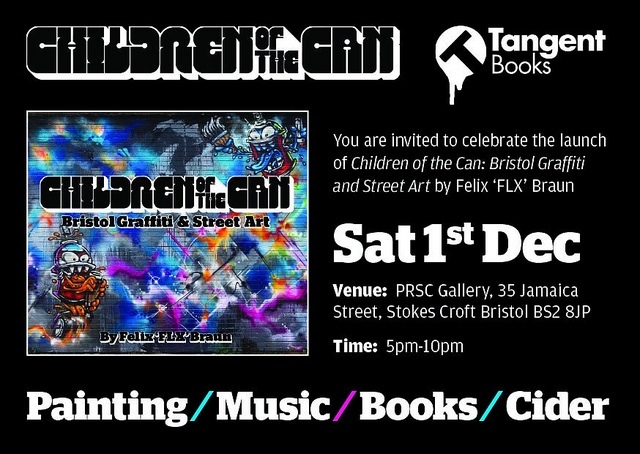 Children of the Can: Bristol Graffiti and Street Art, the follow-up to 2008’s hugely successful Children of the Can: 25 Years of Bristol Graffiti is launched at PRSC on Saturday 1st Dec. The Launch will take place at 5pm and there will be music and merriment into the evening. Throughout the day, there will be painting throughout Stokes Croft by Bristol’s Finest. What started out as a straightforward second edition quickly took on a life of its own and has grown into a new project. Since the initial publication of Children of the Can the Bristol graffiti scene has seen emergence of many new artists and events, cementing Bristol’s status as one of the UK and Europe’s most influential cities in the street art movement. Author Felix ‘FLX’ Braun started writing graffiti in the mid-80s and grew up with the Bristol scene painting alongside the likes of Inkie and Nick Walker. He continues to live and paint in the city and has unrivalled access to the artists and their work. Here, they tell their stories in their own words. Most of the images in Children of the Can have never before been published and many have been provided from the artists’ sketchbooks and private collections.